When to Buy: Apples are usually available year-round in the grocery store. But fall is when apples are in their peak season (ranging from September to November, depending on your location and the variety of apple) and especially crisp and delicious. Farmer’s Markets often carry local varieties that are particularly fresh or if you are lucky enough to live near an apple orchard, pick your own. What to Buy: Look for crisp, firm (bruise-free) apples with a nice shade of color. Stay away from apples with soft spots as this indicates over-ripening. 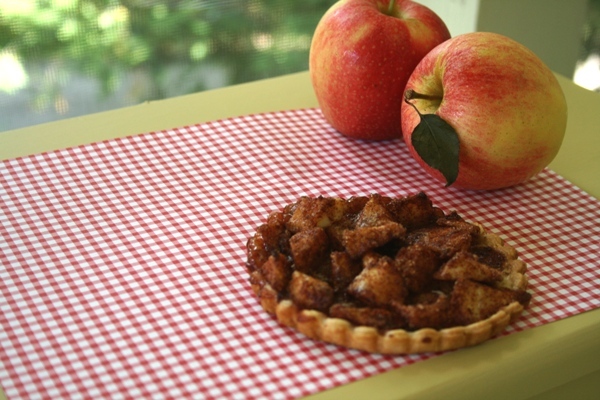 If you plan to cook your apples, Granny Smiths retain their shape well while offering a tart flavor. Naturally sweet apples include the Gala and Red Delicious varieties which are perfect for apple sauce as they cook down easily. For snacking purposes, I recommend the Honeycrisp variety as it is sweet and tart. Prep and Storage: Apples store best when refrigerated as this prevents further ripening. Before taking your first bite, give it a quick rinse. Some recipes may require the skin to be removed — a simple paring knife works. Though I recommend leaving the skin on as it is nutritious and tasty. Apples do brown quickly after being cut so prevent browning by squeezing fresh lemon juice on the apple slices. How to Cook: Apples are the perfect go-to snack food — munch on one while walking to class, as they are crumb-free! So cooking is certainly not required, but there are so many delicious apple recipes that it will be hard not to want to cook with this versatile fruit! With my sweet tooth, an apple pie is my favorite way to enjoy or, rather, devour cooked apples — buttery, flaky crust with cinnamon, sugar and apples piled high! If you are desperate for apple pie, but have little time (a situation I was recently in), try this simple, individual apple pie recipe. Go ahead and make two and share…they are small. No need to wait until dessert to enjoy apples- impress your friends and serve Pork with Sautéed Granny Smith Apples. Recipe Box: Check out our favorite apple recipes! Caroline Ariail is a senior at the University of Georgia where she studies journalism. Caroline is passionate about health and fitness and one of her favorite snacks is an apple with peanut butter.